In addition to our Pamper Day Packages, the following individual health and beauty treatments are also available. Reflexology & Gel File & Polish on the Toes Please advise if you are already wearing Gel polish as we will need to book additional time to allow for its removal. £5 will be charged for this service. A relaxing mini back massage, face neck and scalp massage, finishing with a mini Dermalogica Facial. A complimentary consultation can accompany any of these treatments. Please add an extra 30 minutes to the treatment time. A full body polish using one of our fruity sugar scrubs followed by a nourishing body cream massaged into the skin. Lets experiment to create that perfect look that is ideally suited to you. 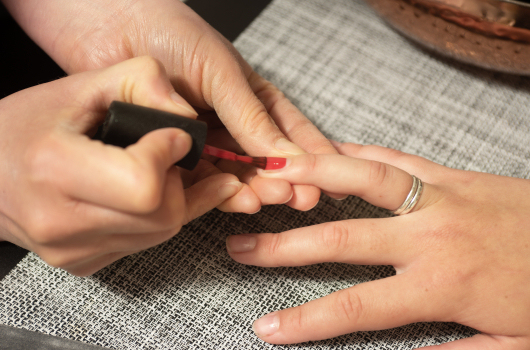 Enjoy a Jessica manicure and pedicure, followed by eye lash tint and eye brow shape( patch test must be done 24hrs before) Bikini wax and finishing with a relaxing back massage. This lashing treatment lifts and curls lashes right from the root helping to enhance and emphasise the eyes, whilst creating the illusion of length and volume. Lasting 8 weeks. An excellent de-stressing treatment, ideal for relieving neck and shoulder tension. A firm-pressure foot massage that helps to boost the immune system and energy levels. A pleasant and non invasive cleansing of the ear canals. Beneficial to those with ear or sinus problems, excessive ear wax or just for general relaxation. Includes a de-stressing head & face massage. Enjoy a GELeration File & Polish on your hands or feet that will last for upto 3 weeks! An indulgent finish to the GEL nail treatment, with a luxurious hand scrub, massage and application of paraffin wax will leave your hands feeling refreshed and relaxed. Have the perfect Gel finish to the full deluxe Pedicure treatment! The ultimate treat for feet! The skin base microdermabrasion facial is a safe, controlled treatment that intensely exfoliates and resurfaces the skin. A fine jet of crystals strike the skin to gently remove dead skin cells layer by layer. At the same time,a vacuum sweeps up both the crystals and the skins cellular debris.The production of collagen and elastin is stimulated which results in a firmer, more youthful looking skin. For when time matters... Enjoy a quick skin refreshing treatment including a cleanse, exfoliation, nourishing face mask and moisturiser. A facial which is tailored to your own individual skins needs. This facial includes a relaxing hand and arm massage. Designed to treat prematurely aging skin, includes a vitamin enriched power exfoliation and nourishing vitamin mask to improve skin elasticity and tone. This facial includes a relaxing hand and arm massage. A relaxing back massage followed by a prescriptive treatment using specialised products and techniques to enhance skin tone and cell renewal, this advanced facial is the ultimate in relaxation. A Brazilian wax will remove as much hair as possible from the front and the back of the pubic area. Designed to remove ever last bit of hair. LYCON delivers great results removing stubborn hair as short as 1mm, great for facial waxing, bikini and underarms.